Star Wars geek fashion was not in short supply this past weekend at New York Comic Con 2015. Her Universe, SuperHeroStuff.com, and We Love Fine were out in full force, providing geek fans with the latest Star Wars inspired apparel and accessories. Exploring the show floor and seeing what more it had to offer, however, revealed more hidden and unique treasures made by fans just like you. From custom hair bows to one-of-a-kind dresses, New York Comic Con 2015 did not disappoint on the geek fashion front, and I can only imagine what the future of the convention will look like after Star Wars: The Force Awakens jump-starts a new era of fashionable apparel and accessories. Kim and Al’s Bowtique specializes in making custom bows, from standard solid colors to geeky prints. Made in New York, each bow comes with an alligator clip in the back for easy application. The Bowtique also takes custom orders, and with so many new Star Wars fabrics in the market, if you want them to make a bow and you have the fabric, contact them for more information. You can visit their online shop at Kim and Al’s Bowtique and follow them on Facebook, Instagram, Tumblr, and Twitter. Laura and Shaun Rosado started PopCycle Baubles “in an effort to help give back to comic fans and the geek community we love. Bringing books out of those long boxes and making them into everyday functional items to celebrate art and books.” From fully lined and padded handsewn purses to embroidered felt hair bands, this booth had the coolest geeky things, especially when it came to Star Wars. Follow them on Facebook and Twitter to find out where they’ll be next and how you can add one of their lovely handcrafted pieces to your accessories collection. I stumbled upon the Love and Madness booth by pure chance, and I’m so glad I did because one of their upcoming collaborations is with Star Wars. 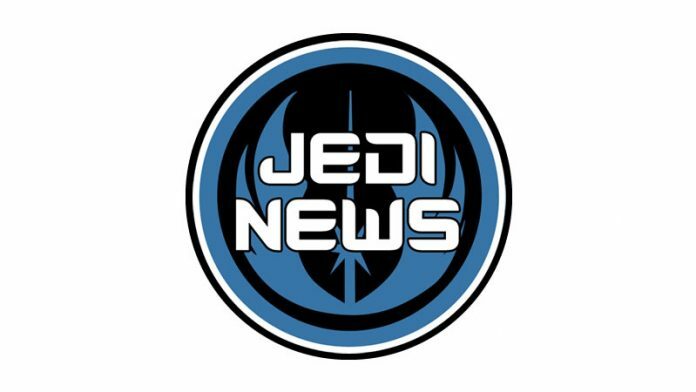 According to their site, Love and Madness will be “launching a line of both nostalgic jewelry, tattoos, and hair accessories with Star Wars and for The Force Awakens…we will be sharing more soon.” The booth had a variety of affordable Star Wars jewelry that will excite any fangirl. Make sure to follow Love and Madness on Twitter, Instagram, and Facebook for the latest updates. Jewelry featuring or inspired by Star Wars female characters is a rare sight. A lot of the merchandise out there features the standard Rebel Alliance symbol or Stormtrooper helmet, but where’s the variety? One of my favorite places to find necklaces and earrings of that nature is at the Outer Rim Toys & Out of the Toy Box Jewelry booth. Here, you’ll find lightsaber earrings, LEGO necklaces, and best of all, Ahsoka Tano earrings. That’s the kind of jewelry I want to wear, featuring characters that I know and love. Follow Karen’s Facebook and the main Facebook page to find out where they’re headed next or to contact them for more information. If you’re looking for quality, geeky bags to hold your essentials during your next con-going experience, look no further than Earthly Leather Design. With over 25 years of combined experience, this shop specializes in leather products, including leather clip bags. Versatile and made with care, you can wear the clip bags in four different ways: (1) with belt loops attached to your belt, (2) with a purse strap, (3) clipped directly onto your pant loops, (4) or as a fanny pack. Keep up to date on shows, sales, and general information by visiting their website and Etsy and by following them on Twitter and Facebook. For comfortable and slimming apparel, Retro Dynamite specializes in making geeky t-shirt dresses. Not pictured is the Star Wars X-wing Fighter pencil skirt t-shirt dress, an item that can be found in Retro Dynamite’s Etsy shop. “My mission, as a female nerd myself, is to encourage INDEPENDENCE to other female nerds and to all women, and to offer comfortable classy clothing for all sizes!” wrote Shannon, the owner of Retro Dynamite, on her website. Find more pictures of her making the blue Death Star and Millennium Falcon t-shirt dress, as pictured above, on Facebook. Little Petal takes your favorite geeky characters and creates custom convertible dresses and garments. 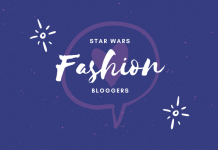 If you visit their website, you’ll find a dress inspired by Leia’s slave attire from Return of the Jedi as well as many other geek inspired designs. The owner and head designer at Little Petal, Danielle Ward, “strives to make all women look as beautiful as they feel without sacrificing who they are.” If you’re looking to create your own Star Wars inspired dress, definitely check out Little Petal for more information. Also, all dresses are available with pockets upon request–what’s not to love! Follow them on Facebook, Twitter, Instagram, and Tumblr. Johnamarie Macias is the keeper of TheWookieeGunner.com. She is also the host of Rebels Chat and Galactic Fashion and a contributor for Fangirl Next Door.